You guys. 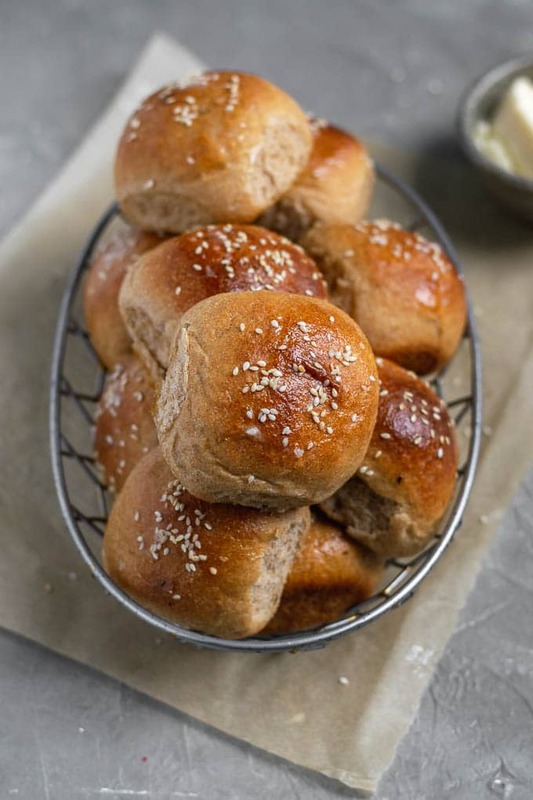 These aren’t just soft whole wheat dinner rolls. They are the softest, most tender, of dinner rolls. Made with 100% whole wheat. Not a sprinkling of white flour in there! I’m completely blown away and you will be too! When I set out to create a 100% whole grain bread roll, I have to admit my expectations were low. Whole wheat bread usually is vastly enhanced by using white flour for up to 1/2 of the total flour. 100% whole wheat bread has a reputation for being less tasty as well as dry and dense. I expected to go through a lot of trials with this recipe to get it perfect, so you can imagine my surprise when it came out perfectly on the first try! Like, there was literally nothing I wanted to change about this bread. They are soft and tender, fluffy and moist. The kind of squishy bread you want to accompany your dinner, but makes an equally good snack/breakfast/bun. The flavor is just spectacular, nutty and rich, malty and faintly sweet. 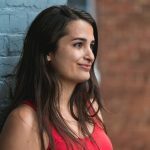 To be certain, I actually went through 3 trials of the recipe anyway–making sure the first time around wasn’t a fluke, making extra to share with friends to make sure I wasn’t just a crazy whole wheat lady (and I’m not, 0 problems with white bread here! ), testing it with a substitution for a possibly harder to get ingredient (potato flour). This bread could do no wrong! Unless you’re allergic to wheat, then unfortunately this recipe isn’t for you. 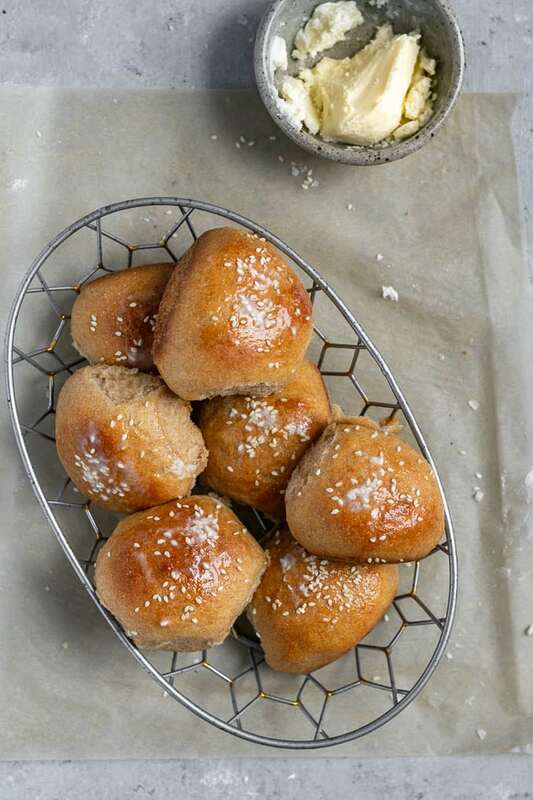 These rolls are great for eating warm from the oven and for making in advance to serve with dinner. If made the day before they reheat really well in the oven, and I love slicing them open to toast and slather with some vegan butter or cashew cheese for breakfast or a snack. 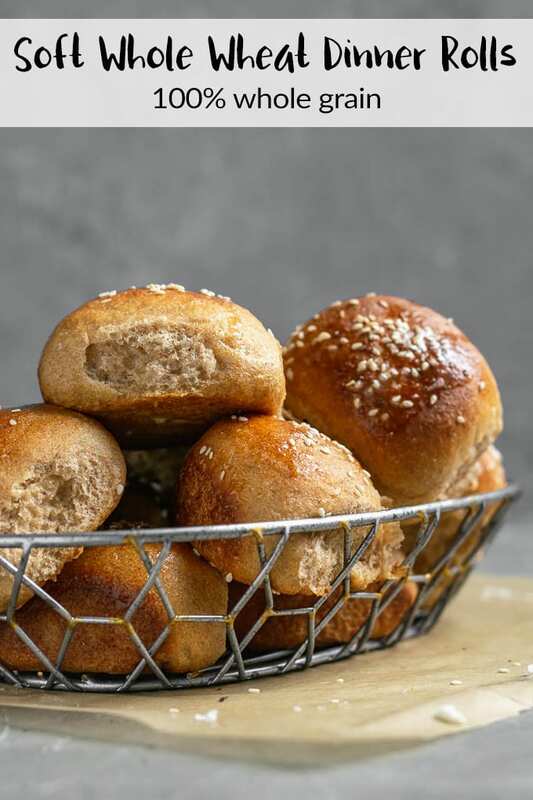 So what’s the trick to making ultra soft whole wheat dinner rolls? First, we use the wonderful ingredient potato flour. Similarly to my sweet potato rolls that I made last fall, the starches in the potato act to tenderize the crumb of the bread. This effectively means that bread with potato in it is going to be softer. Instead of cooking and mashing up a potato to mix into my dough, which adds time and effort to a recipe, I grabbed for potato flour. Potato flour is dehydrated and finely ground potato. No other ingredients added. It’s absolutely perfect for this recipe! Since potato flour might be a slightly more specialty ingredient, so I went ahead and tested these rolls with mashed potato flakes, which are dehydrated potato that’s been shredded into fine flakes. This ingredient is easy to find just about anywhere (with the frustrating exception of my local organic grocery store) so you’ll be able to make this recipe no matter where in the US you live (if you’re not in the US just wondering, are potato flakes a thing where you live?). Well, I couldn’t tell the difference between the rolls with potato flakes and the ones with potato flour! Even in side by side comparisons! So you can use whichever ingredient you prefer with no loss in texture or flavor. Secondly, I used a technique similar to making pastry to cut down on the formation of the gluten (protein) network. What I did was take refined coconut oil in it’s solid state and rubbed it into the dry ingredients. This coated the grains of flour which “shortens” the gluten strands. Whole wheat flour is higher in protein (which means higher in gluten) than white flour, and while we depend on gluten to give bread it’s quintessential properties, too much gluten can lead to a denser and chewier result, which is not what we’re going for with this recipe. Since I don’t want my bread to taste of coconut, I used refined coconut oil instead of unrefined, but this is personal preference. Adding the oil in its solid form allows you to rub it into the flour with minimal clumping. The final mixture will be sandy, with the occasional small pebbly bit. Third, instead of water I’ve used non-dairy milk. Along with adding the fat, this makes for an enriched dough. Which means, softer & more tender bread! I used oat milk, but any will work (with the possible exception or rice milk which I find to be very watery). Whole wheat can have a bit of a bitter taste thanks to the bran being included in the flour. To combat this we add a little sweetener to the dough. The liquid sweetener not only assists with the malty sweet smell of the bread, it also acts to create a more tender and soft crumb. 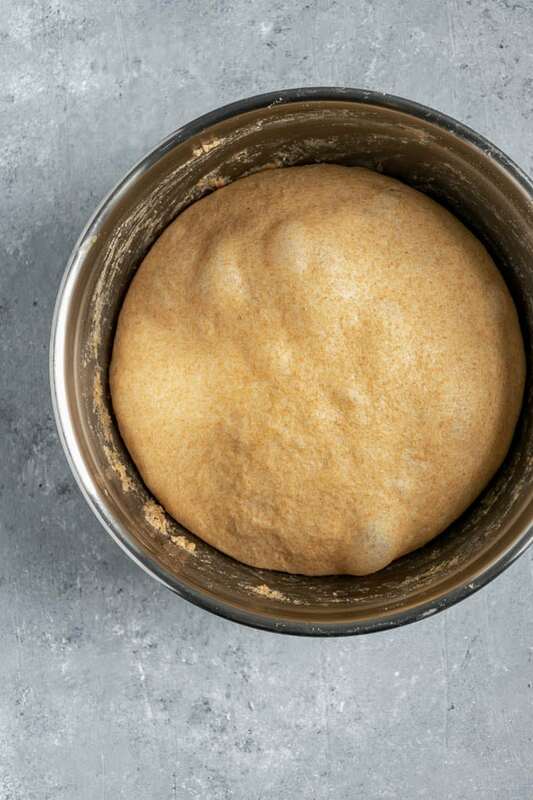 I love using instant yeast in my bread recipes, it’s so straight forward to use–mix it into the dry ingredients and proceed with your recipe! But if you have active dry yeast you can definitely use that instead. A couple notes: active dry yeast needs to be hydrated before being used in the recipe, so add yeast to the warm milk and maple syrup and let hydrate for about 10 minutes before mixing it into the rest of the dry ingredients (after the coconut oil has been added). The other thing this bread benefits from is patience. For soft and fluffy rolls you must give the dough the time it needs to rise. Right now in my kitchen it’s still a bit on the warmer side and the dough doubles in about 90 minutes. 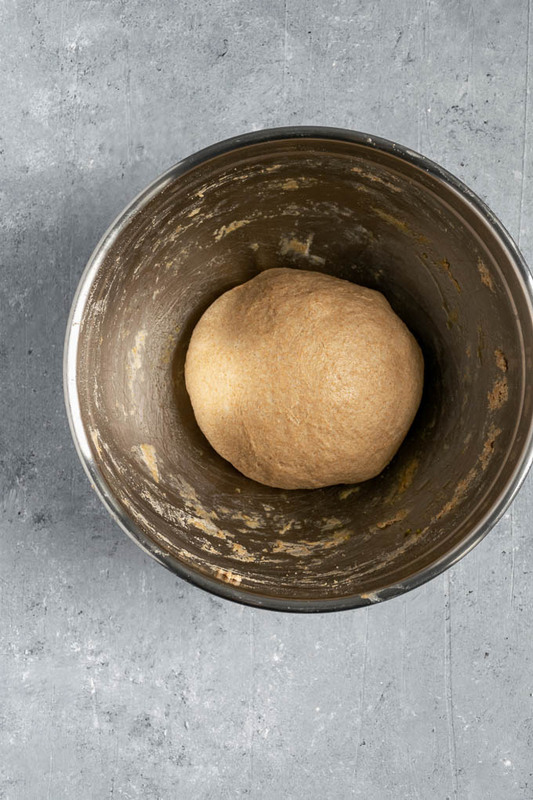 But later in the season when it’s colder out and if you have a drafty kitchen, just make sure to give the dough the time it needs to double in size. If your kitchen is cold you can always turn the light on in your oven and place your dough in there. It’ll make a slightly warm and non-drafty environment that your yeast will love. That being said, most of the time I’m all about not rushing the rising process of dough, because that’s what makes bread taste so good. But if you need bread in the shortest amount of time possible then do what you have to do! And now, enjoy your soft whole wheat bread rolls! 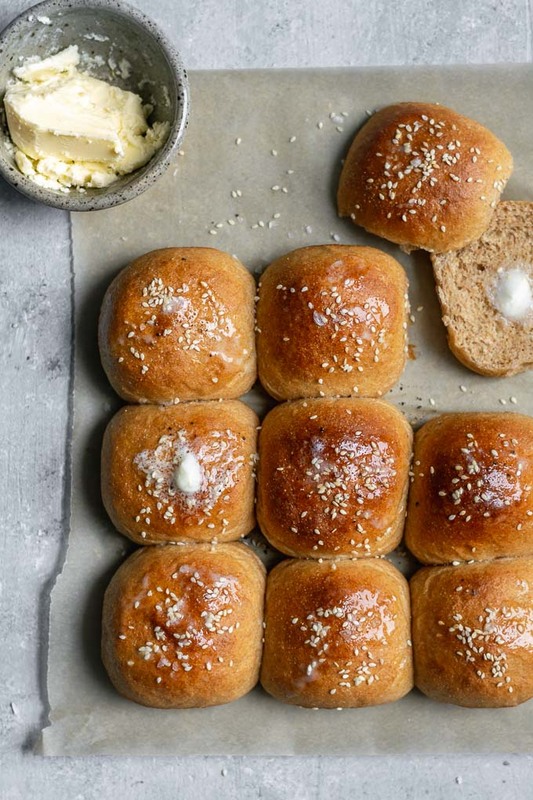 We gobbled these rolls up alongside my butternut squash almond bisque and it was heavenly. The soft bread is perfect for scooping up the last bits of soup left behind in the bowl. With this combo, everyone is part of the clean plate club! 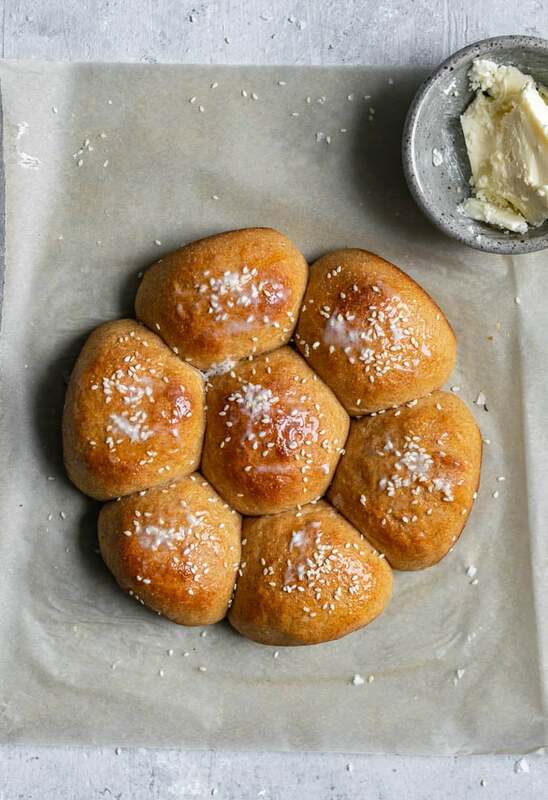 I can guarantee these softest of soft dinner rolls will be a part of our Thanksgiving menu. Having that extra serving of whole grain with all its fiber and nutrients snuck into our meals is going to be appreciated. And even better when you don’t sacrifice on flavor and texture! Another note about whole wheat, did you know that bread made with whole grain takes longer to go stale? This means that you can get away with making the bread a day in advance and still serve it to company (especially if you just pop it in the oven to warm up a bit beforehand, I’d do 375-400 ºF for about 5 minutes). But with a little toasting this bread tastes as good as freshly baked even after 3 or 4 days (possibly longer but I can’t speak to that as it didn’t last that long in our house!). And with that I hope I’ve inspired you to make your own bread for the holidays this year! And just to make bread in general! 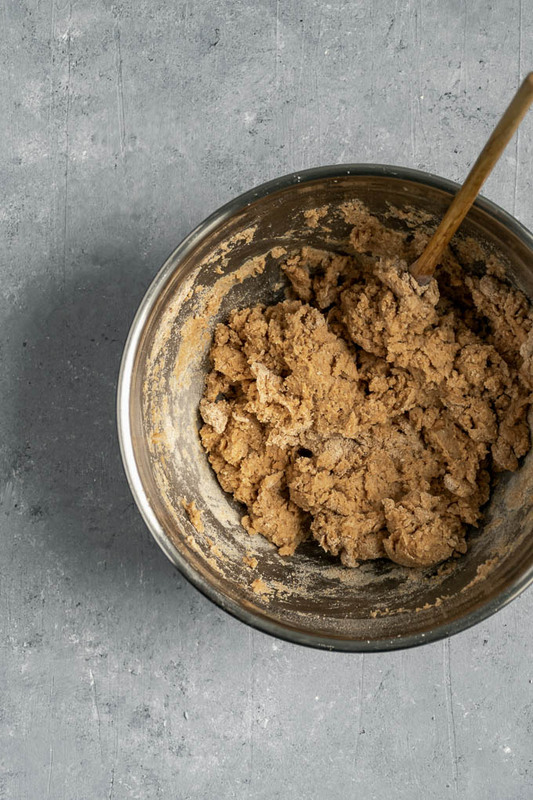 It’s easy to do, especially if you have a stand mixer, but the way I’ve broken down the kneading makes this recipe a breeze! And actually the pause in kneading is important as it gives the dough time to hydrate and relax so that the kneading is more effective! 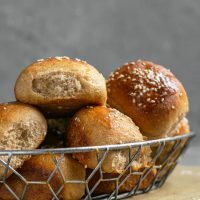 If you make these soft whole wheat dinner rolls, let me know how it goes! Leave a comment and rate the recipe below! And tag your recreations @thecuriouschickpea and #thecuriouschickpea on Instagram, I absolutely love seeing your photos! You should be able to use softened (not melted!) vegan butter instead of the coconut oil, but I haven’t tested the recipe this way. If you make this substitution please report back with how it went! I highly highly highly recommend you use a kitchen scale (there are cheaper ones too, but that’s the one I have) to measure your ingredients for baking. But if you don’t have a scale then be very careful with how you measure your flour. Whisk, scoop, then level the flour in the measuring cup. If you just scoop un-fluffed flour you are pretty much guaranteed to be using too much flour which will lead to a dense and unsatisfactory roll. In a large mixing bowl whisk together the whole wheat flour, potato flour, salt, and instant yeast (see note if using active dry yeast). Add the coconut oil and rub into the flour with your hands until you have a sandy texture, some small clumps are okay. Add the warm non-dairy milk and maple syrup and mix with a wooden spoon until combined. If kneading by hand: Turn the dough onto a lightly floured counter and knead for 3 minutes. Add a dusting of flour as needed to prevent the dough from sticking too much to the counter or your hands. Let the dough rest for 5 minutes. Then, knead an additional 4 minutes until you have a tacky but smooth dough (note: whole wheat dough does not get as smooth as your white flour doughs). If kneading with a stand mixer: Mix on low speed using the dough hook for 3 minutes. Turn the mixer off and let the dough rest for 5 minutes. Mix again for 3 minutes with the dough hook on low speed, then turn the dough onto a lightly floured counter and knead by hand for 1 minute. Make any last adjustments with flour to get a supple but tacky dough. Drizzle some oil into a large bowl and turn the ball of dough around in the oil to coat. Cover with plastic wrap and set aside to approximately double in size, about 1 1/2-2 hours. 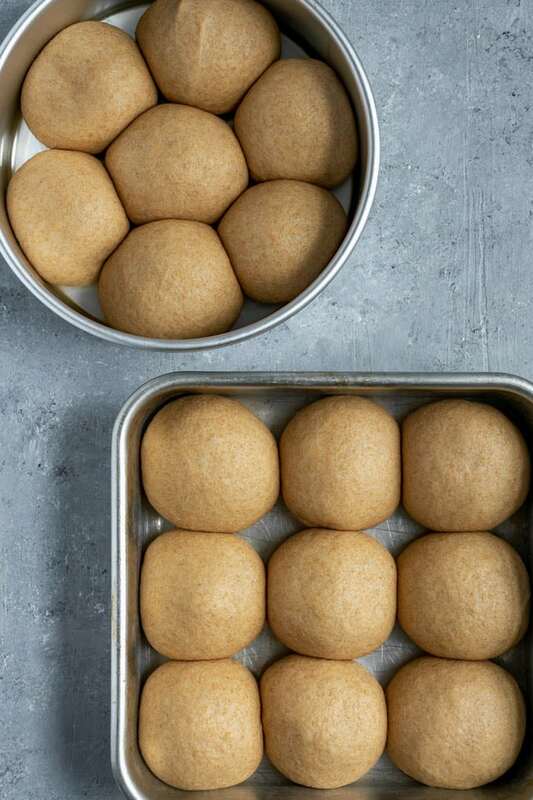 Divide the dough into 16 pieces and shape into balls. Cup your hands around the ball of dough resting your fingers and heel of your hand on the counter and roll it around to create a taught skin and seal the bottom seam. 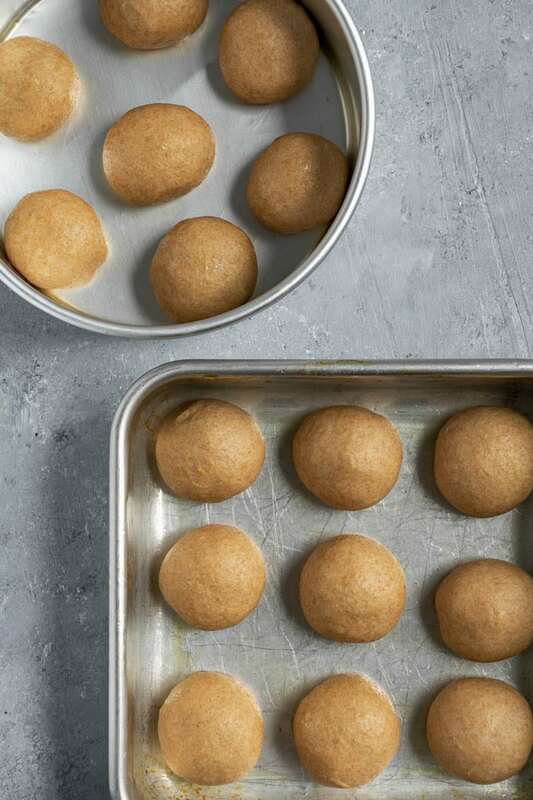 Place the shaped rolls in an oiled baking pan (they will not touch)--use 2 8 or 9" round pans or square pans or a 9x13" rectangular pan. Cover with plastic wrap and set aside to rise for 1 1/2 to 2 hours until doubled in size. About 30-45 minutes before you're ready to bake, turn the oven to preheat to 375 ºF. Brush the rolls with plant milk and sprinkle with sesame seeds (optional) before putting in the oven and bake for 15-18 minutes until darker and golden on top. Let cool 3-5 minutes then transfer to a cooling rack, and brush with melted vegan butter if desired for an extra buttery tasting roll. *To measure your flour by volume: whisk the flour to undo any settling, scoop, then level with the back of a knife. Otherwise you will end up measuring too much flour for the recipe. *can substitute active dry yeast, but mix the yeast with the warm milk and maple syrup and set aside for 10 minutes to dissolve before using.